I received product for review from Colortime Crafts and Markers. The opinions within this post are of my own and I was not influenced in any way. Please do your own research before purchasing products or using services. Your opinions and results may differ. Keeping kids entertained now that school's out can be a daunting task. If you're reaching for ideas, consider Colortime Crafts and Markers. The company has easy craft ideas for kids, including t-shirts, pillowcases, backpacks, tote bags, and more that children will love to color and decorate. They have keepsake craft products specific to boys and girls, as well as religious, holiday, and even dog wear items. They're also a great company to consider if you're planning for a birthday, scouting, or other event. 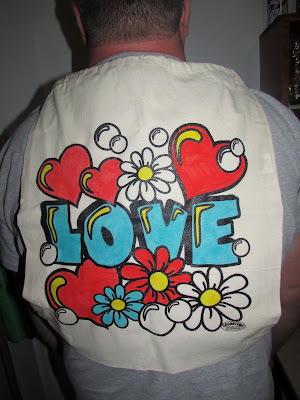 I received the Love Backpack for review and, well, love it. The drawstring backpack is decorated with a cute image that can be colored. 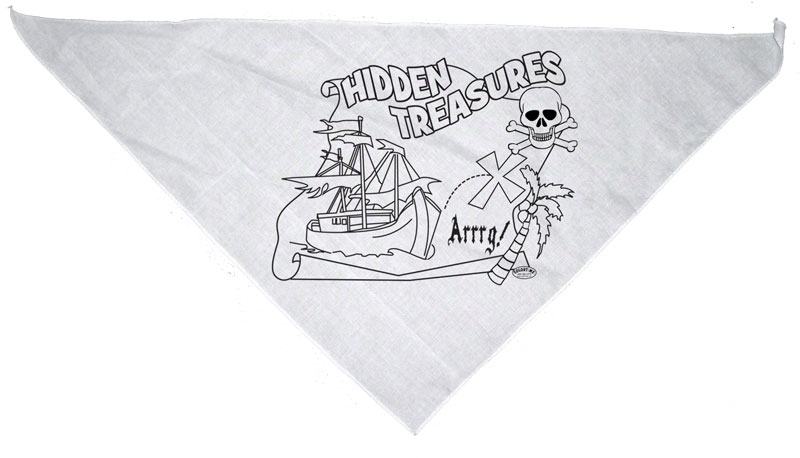 Colortime Crafts and Markers has their own line of permanent fabric markers that are non-toxic. I got three markers - red, yellow, and blue - to color in the image of my backpack. I was pleasantly surprised with how well the markers worked. I had no trouble coloring in the "Love" design. I've used some fabric markers before that weren't worth the materials they were made with. These markers have a thick grip and the colors show up vibrantly. I didn't have to press down hard or struggle to get the markers to fill in all the desired space. There was no smearing or smudging when switching between the colors. I took notice and liked that the yellow colored marker didn't blend in with the black fabric of the image design. Yellow usually tends to do that and it looks like a smeared mess. The backpack itself is roomy and can fit a lot of contents. It is made of good material and fits up to an average sized adult. Although I haven't done it to mine yet, the backpacks are machine washable. I would like to note that the fabric markers have to be purchased separately from the "color yourself" crafts. They can be purchased individually or in sets. Discount Code: Receive 15% off online retail purchases at colortime.com when you use coupon code 15for30C. Offer not valid on sale items and may not be combined with other offers or discounts. Offer expires on July 18, 2017. Free Shipping: Receive free ground shipping on orders over $60 in the continental US when you use code FRSHW at checkout. Only for retail, web-based orders, placed on the website. Not to be combined with any other offers and discounts. Facebook Giveaway: Colortime does a weekly fan giveaway on their Facebook page. Each week Colortime Crafts and Markers will randomly draw one lucky fan who will receive a special craft package, which includes a Colortime print item of choice and three special permanent Colortime FABRIC MARKERS. All you have to do to be eligible is to "like" and become a fan of Colortime Crafts and Markers on Facebook. The winners' Facebook name will be posted each Monday on the Colortime Crafts and Markers Facebook page. A message will be sent on Facebook informing you that you won. Look for it, and if your name is a winner, you can also send us an email message to info@colortime.com with your full name and address and in either case we will ship your prize within 2 weeks. 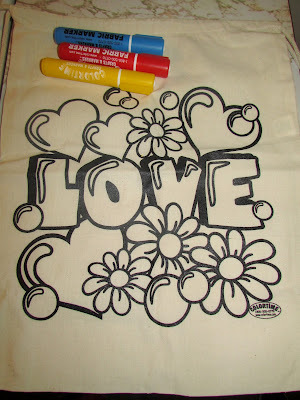 1) You must be a fan of Colortime Crafts and Markers (www.facebook.com/colortimecrafts) Facebook page. 2) Once you win a prize, you are not eligible for additional prizes for this promotion for 12 months after the prize has been awarded. 3) Prizes not claimed within 2 weeks will be forfeited. Free Coloring Pages: Colortime Crafts and Markers offers free coloring pages available for download. Birthday Club: Sign up for the "Birthday Club," and as the birthday approaches, Colortime Crafts and Markers will send you a special coupon code and a free exclusive members-only "Birthday Club" backpack - with your order. To receive the free backpack, you must use the code you're provided with for 20% off your order (minimum of $20). 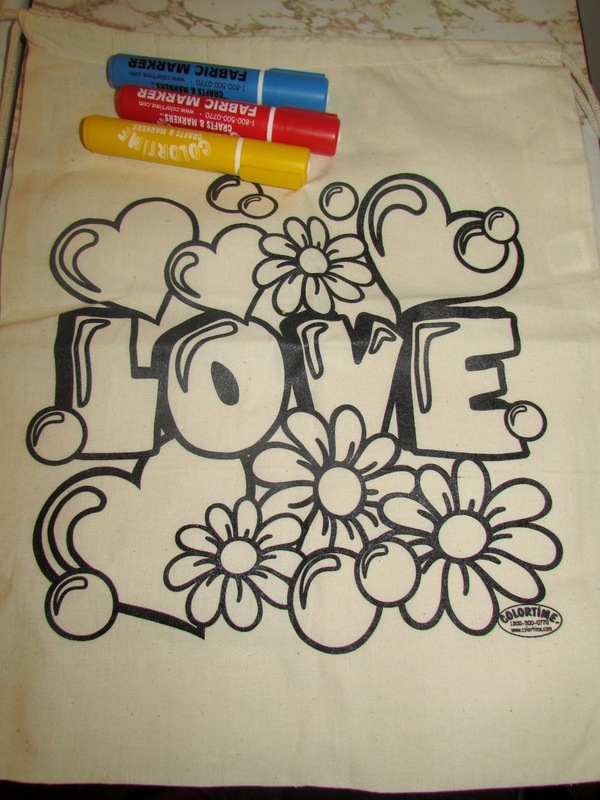 One person will win a drawstring Backpack of choice and three fabric markers from Colortime Crafts and Markers. to color from the website. I like the GIRL POWER T-SHIRT. The girls will love to color it. I like the pillowcases that you can decorate!! I like the bold fabric markers. I love their pillow cases. These are all very cute and would be a blast to do with my granddaughter. Thanks! They have a lot of cute products. I like the Be Yourself Pillowcase. I like the Shema bedtime prayer pillowcase. I love the Haunted Halloween Tote Bag! At $4.95, each child could color their own!! I like the Girl Power Pillowcase! I like the Monster Trucks T-Shirt . I like their bold fabric markers. I really like the girl power pillow case. I like the Spaceship pillow cases. My grandson would love the Monster Truck T-shirt. I would like to have the DOG STUFF NECKERCHIEF for my dog. I think it would be fun to get Isaak http://www.colortime.com/Blank-Craft-Pillowcase-p/2000.htm it's just a white pillow case. Then he could draw whatever he wants on it. I like the Let It Snow pillowcase. S'MORE FUN T-SHIRT looks fun. I like their love plush tee! I like the Smore Fun pillowcase! Also love the SUN MANDALA TOTE BAG. I like the Haunted Halloween tote bag. Perfect for candy! I really like the Bright Value Pack of Fabric Markers. My grandson and I could have a fun weekend with these markers. I like the Girl Power shirt & the pillowcases. I like the Pajama Party and Camp Survivor Pillowcases. I lie the pillow cases and the teddy bear. My grandson would love their Monster Trucks T-Shirt. I love the Pajama Party pillow cases. My daughter has her first birthday slumber party coming up and this would be a fun activity for it! I really like the Love Pillowcase! I like the totes to color. I like the sun mandala tote. I like the girls play strong t-shirt. I like the Fabric Markers Economy Pack Pastel colors. HAUNTED HALLOWEEN TOTE BAG would be cute for Halloween. i would love to decorate the love plush tee. it is really cute and would be fun to make it mine by decorating it! I want the Halloween tote bag. I like the Smore Fun Daily Backpack! I like the love pillowcase. I heart the Santa Roof Top Pillowcase. I like the All Star Backpack. I think my nephew would like the All Star Backpack. I like the love t-shirt bundle. I like the BRIGHT VALUE PACK OF FABRIC MARKERS. i like the love t shirt bundle..so cute it comes with matching doll size. I like the Bright Value Pack of Fabric Markers. I like the bright colors and I think the grandchildren would love to draw on some tees on a long summer day. 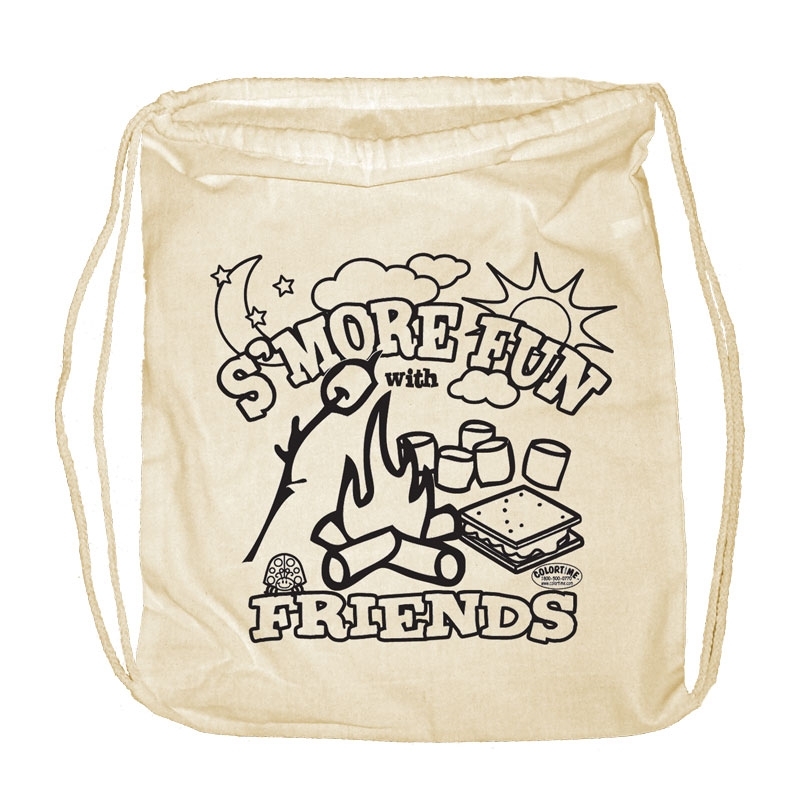 The Smores bag is so cute! I love how they also have pillowcases for you to create as well! I like the Halloween Haunted Tote Bag. I like the girl's Peace, Love, Gymnastics tote bag.